The logic is simple. If, for example, your source patent is classified in one primary (Original) class and cross references four other classes, doesn't it stand to reason that patents with the most similar class profiles will also be similar to the target patent? This technique is possible because AcclaimIP's search engine is aware of each classification's relative position in its hierarchy, including all parent and children classes. 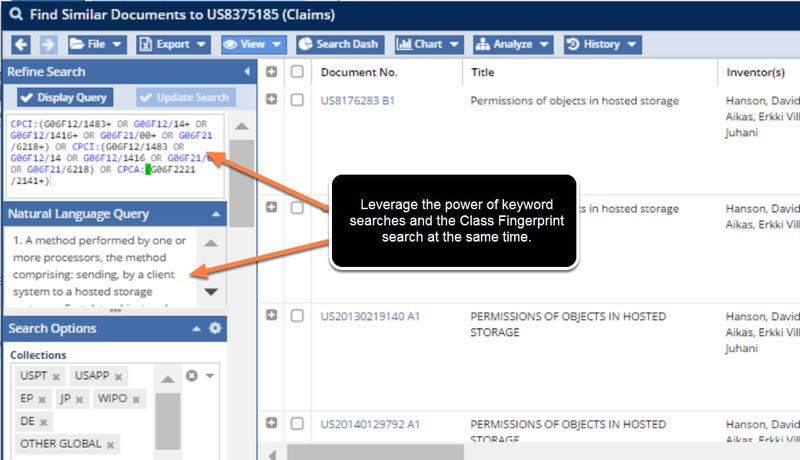 On the Document Details window, you will find the Use Class Fingerprint search under Analyze>Find Similar Documents. You can then choose what class you want to search by. Here I have chosen to use CPC class codes. This is because I see that there are multiple classes that the search can use in order to find results. Once you've tried the Use Class Fingerprint search a few times, you'll see that class fingerprinting is both equally powerful and doesn't rely on the vagaries of human language. You should make the Use Class Fingerprinting tool a part of your search repertoire. For this example, we picked a patent with multiple classes, because the search works better when the patent is classified in at least two classes. If the patent lists only one class, then the Class Fingerprint technique simply returns a normal class query, including children, with only a slight improvement to the sorting. This is because there is nothing else to profile. OK, so this crazy-powerful technique will give you amazing results because it uses both techniques described in this chapter. 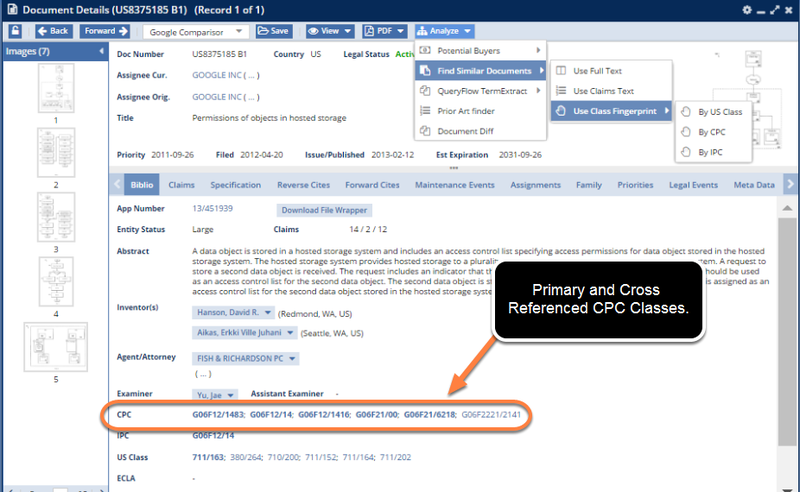 From Analyze>Find Similar Documents, run the Use Class Fingerprint query on a patent and copy the query from the search window. On the same patent as you ran the searches on above, from Analyze>Find Similar Documents, run either a Use Full Text or a Use Claims Text search on the same patent. 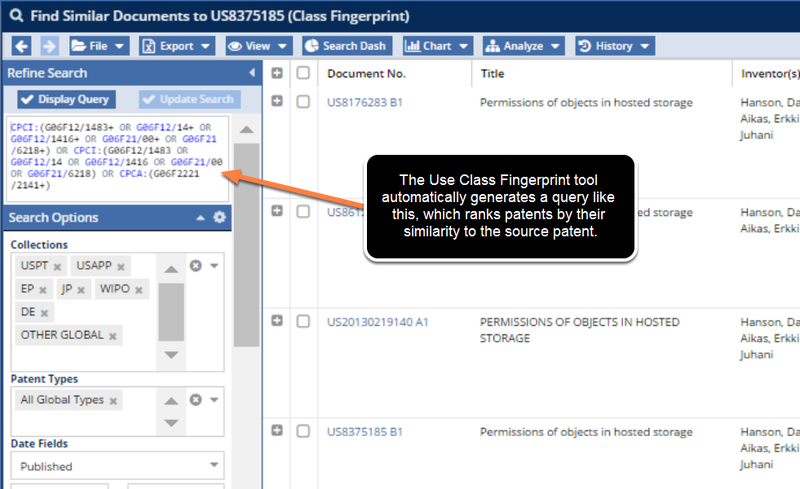 Paste the Class Fingerprint query into the query window of step number 2 and update the search.